In a time where stretching your hard-earned dollar is almost as important as making that dollar, people are looking for more bang for their buck when it comes to entertainment. That’s why summer festivals like Rock The Bells make so much sense. Usually, by spending just a little bit more than your average concert ticket, one can see dozens of acts throughout the day. With festivals of all genres of music popping up over the years, that’s a hard deal to pass up. I found myself in that exact situation on Aug.21 when I had the opportunity to attend the Rock The Bells concert at the NOS Events Center in San Bernadino, Calif. Personally, I am a big fan of Guerilla Union, but this was my first chance to attend one of their shows. While the event was an overall success for Guerilla Union, here is a list of five things I picked up both from my own observations and from comments I overheard from other patrons that could have made this event that much better. 5. Parking. I arrived at noon to find two long lines leading into two parking lots. I was able to squeeze into one line for what I thought was a general parking area, but quickly discovered was a line for Preferred Parking which cost $20. Not wanting to get into another long line I paid and parked. I’m glad I did because I later overheard a group talking about waiting in that line for over two hours. 4. They definitely could have mixed up the sets a little better. They had all the main attractions (Snoop Dogg, Wu Tang Clan, A Tribe Called Quest and Lauryn Hill) go on one right after the other on the main stage starting around 6 pm. That was an issue because apparently a lot of people waited until about 5:30 pm to show up so by the time Lauryn Hill took the stage around 6 pm, you could barely see her from the outskirts of the crowd. 3. Organizers required all food and beverage purchases be made on a Guerilla Union Event Card, which patrons were to load money onto as needed. The catch was that they only allowed people to add increments of $20, so anybody that showed up with less than $20 was going hungry! Also, they only had a few stations set up where one could acquire these cards and even then they were kind of tucked away from the main path. Throughout the day I kept seeing people who were unaware of the event card lose their spot in long lines because they were trying to pay with cash for something to eat or drink. Needless to say, a lot of people weren’t happy about the event card. 2. Being that this event was held in San Bernadino in late August, they had to have known what the weather was going to be like…..extremely hot! I was a little disappointed with the lack of cold food options. There were hot dogs, pulled pork sandwiches, teriyaki, funnel cakes and a whole lot more, however the only cold option I came across was ice cream. It would have been nice to see a cold sandwich booth or maybe even a fruit vendor. 1.The number one thing that I feel could have made this event better was for Guerilla Union to have been better organization all around. They opened the doors almost an hour late, there were set changes between headliners that surprised everyone, and the hired security didn’t seem to know what was going on anywhere with anything. They had mist sprayers in the VIP section only and absolutely no way of cooling down the general admission people aside from two large, circus-like tents that were set up in the middle of the grounds to provide shade. Don’t get me wrong, I wouldn’t have missed this event for anything! 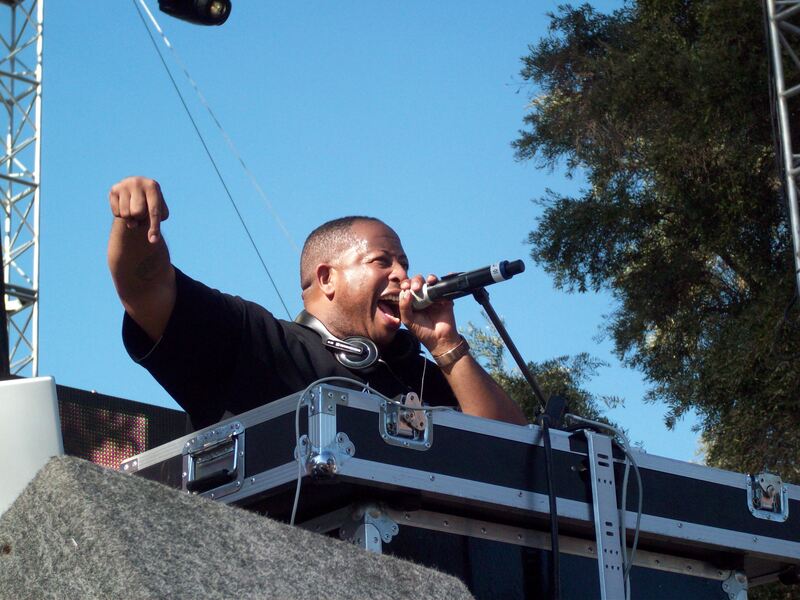 The defining moment of the day that let me know that hip-hop was in the house was when DJ Premier dedicated his whole set to the memories of Big L and his former partner in rhyme, Guru from Gang Starr. Spinning classic track after classic track, DJ Premier had the crowd in the palms of his hands as the crowd kept theirs in the sky for his entire set. A lot of critics over the years have stated in various ways that hip-hop is dead, but at Rock The Bells 2010, as unorganized as it was, hip-hop was indeed alive! It really doesn’t make sense to use a Power Point presentation when the world’s greatest freestyle rapper is in the building. 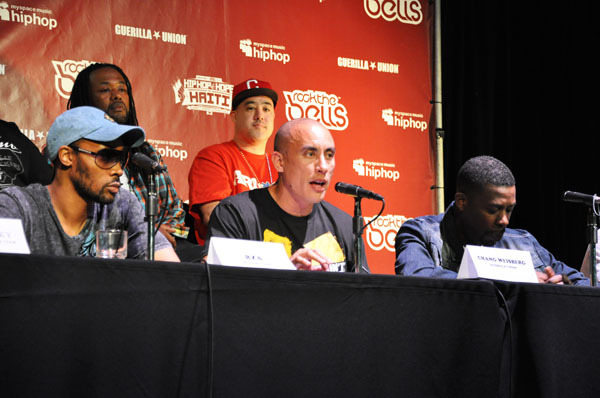 MC Supernatural broke down the upcoming 2010 Rock the Bells tour lineup with an impressive three-minute freestyle rap highlighting the tours headlining acts. If you’re a rap fan, that can only mean one thing — Wu-Tang Clan is back. The eight remainng members of the super group will hit the road this summer to perform their ground-breaking album “Enter the Wu-Tang Clan — 36 Chambers” in its entirety. This year’s tour includes a number of rappers focusing on a single album as part of the tour. Rakim has signed on to play his entire “Paid in Full” record, circa 1987, while hip hop professor KRS-One will perform his “Criminal Minded” album from the same year. “I’ve never as a promoter dictacted what songs an artist will play. I don’t want to contrive anything, but we told Rick that if Pink Floyd was going to do “The Wall,” then Rock The Bells thinks we should do the “…Adventures of Slick Rick” and he said yes right away,” said Weisberg. The bill will have about 10 other rappers in support roles, including Murs, Wiz Khalifa, Clipse, Immortal Technique, Jedi Mind Tricks, Brother Ali, DJ Muggs, Big Sean and Yelawolf. This year, the tour will only hit four cities: Los Angeles (8/21); San Francisco (8/22); New York (8/28) and Washington D.C. (8/29). Chang said he hoped to lengthen the tour to two days by 2011 and maybe include a camping component. As for future talent, Weisburg revealed that his agency missed out on securing one hip hop group that he might go after again in 2011. “I really wanted to book Run DMC, but it just didn’t work out,” said Weisburg.